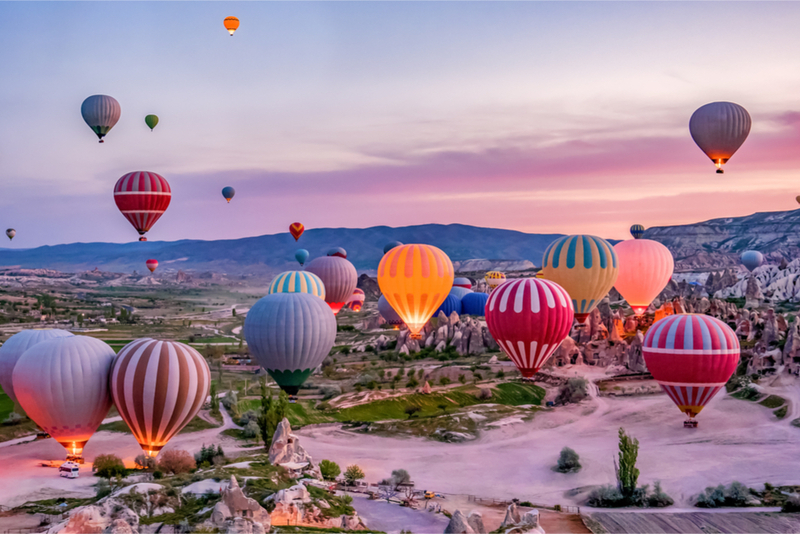 If heights aren’t your thing, ditch Cappadocia’s hot air balloons and keep your feet firmly planted on the ground. There are hiking trails all over the canyons surrounding Göreme, and on your journey, you’ll uncover all sorts of hidden gems: from ancient cave churches to hidden vineyards and chilled-out cafes. I found the Maps.me app super useful for navigating around poorly marked trails and crisscrossing routes. The most famous routes take you through Rose Valley and Red Valley. They’re known for their distinctive rose and red colorings, respectively. 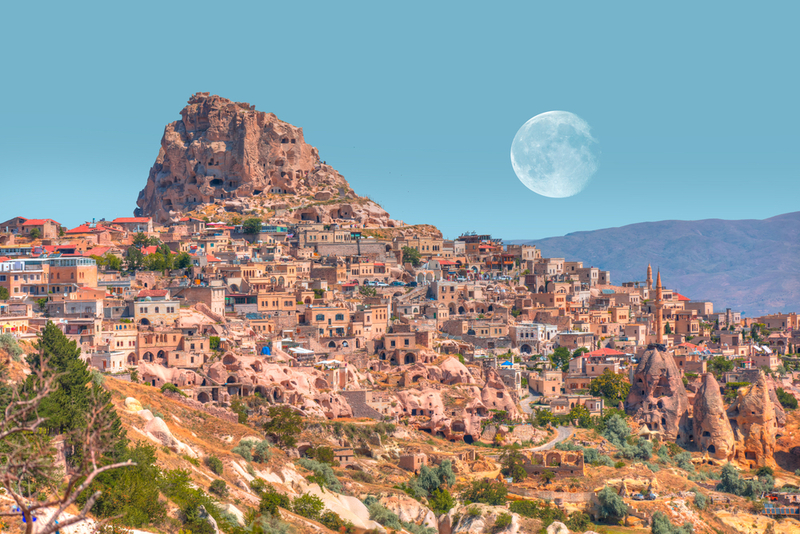 This whole region was formed through ancient volcanic activity, creating the tuff stone that allowed for ancient people to carve out the honeycombing tunnel structures around Cappadocia. It’s also the reason some of the valleys have their distinctive and gorgeous blush coloring. On both of these trails you will find caves to explore and the occasional café to rehydrate at along the way. My favorite hike is through Pigeon Valley, which connects Uçhisar to Göreme, so named for the carved pigeon roosts that dot the canyon side all along the route. The ancient people who used to live in the region raised pigeons for both food and fertilizer, and the sheer amount of roosts they carved is insane. It’s also an incredibly beautiful hike with lush plants, great viewpoints, and lots of hidden vineyards. You start out walking along the canyon’s edge with gorgeous panoramic views of the valleys and mountains until you arrive at a small café overlooking the entrance to the valley. Then you descend and it’s one of the deepest valleys with sheer cliff faces rising on either side of you. Take a hike through Love Valley to see some, um, very hard rocks, if you know what I mean. These natural structures are one of the region’s most famous sights. And if you like those, Ürgup, a nearby town, is home to more unique rock formations that make for an excellent (and honestly pretty darn phallic) photo opportunity. Göreme’s Open Air Museum, Cappadocia, Turkey. 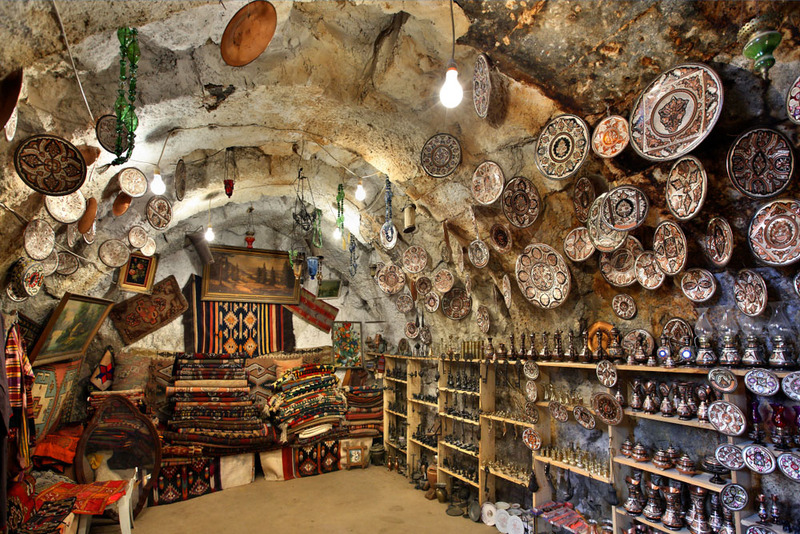 An easy 1.5 km walk from the city center is Göreme’s Open Air Museum. It is a UNESCO World Heritage Site, and a must-see part of the Cappadocian experience. Scattered around the museum grounds are ancient Christian churches dating between the 10th and 12th centuries. Because everything is well-labeled, it’s not the kind of place you desperately need a tour group to get a good sense of, so I would recommend getting there early and exploring while you have the place to yourself. While wandering the museum, you’ll enjoy a rare example of beautiful and well-preserved Christian frescoes. Uçhisar rock castle, Cappadocia, Turkey. From the canyon ledge above Göreme, you can see a towering rock structure in the distance, sparkling with lights. That’s Uçhisar, the remains of an ancient carved out rock castle that is unique outside of this region. While Uçhisar is the most popular rock castle for tourists to visit, I recommend hopping on a dolmush over to Ortahisar. It’s a small town surrounding a smaller rock castle, but because it’s a little off the beaten track, you can find accommodations for pretty cheap, making it a great place to stay as you explore Cappadocia. Hot air balloon rides aren’t the only way to catch the sunrise in Cappadocia! Have a need for speed? Love animals? You’re in luck. You can hop on a camel and experience a guided tour along the valley ridges. I recommend a sunrise camel ride (these tours often yield some pretty badass photos). You can also catch ATV and horseback tours any time of day, ranging from one to two hours, depending on your preferences. If you have the time, definitely give this a try. I was totally jealous of the people on horseback when I’d hiked up to the top of one of the canyons and had to make my own way down. Another one of Cappadocia’s unique features (beyond hot air balloon rides) is its underground cities. The whole region is dotted with them, but at the moment, only a few are open to tourists. These include Derinkuyu, Kaymakli, and Özkonak. These cities are massive interconnected underground superstructures that are unlike any cave structures elsewhere in the world. These caves are each hand-carved and date back approximately 6000 years. In the case of Derinkuyu, it was built to hold up to 20,000 people (plus livestock and goods in case the region’s inhabitants needed a safe place to take refuge in). While exploring, you can go up to eight levels under the ground, with the city sitting just above you. If it’s high tourist season, you’re better off visiting Kaymakli or Özkonak, which are a little bit smaller than Derinkuyu, but also less-crowded and a little more lax in terms of where you can go and what you can explore. If you’re planning on going with a tour, and it’s not a bad idea because there is a lot to be learned with an experienced guide that you can’t glean yourself from looking really closely at the rock, definitely do Derinkuyu. You’ll never forget it and you’ll never see anything like it again. Traditional turkish breakfast with a view at a high-end cave hotel, Cappadocia, Turkey. Because of Cappadocia’s unique landscape, one of the best experiences you can have is staying in a cave hotel! These are carved out of cliffs and fairy chimneys all over the region, so you almost have to work harder to not stay in a cave room than to find one! If you’re a budget traveler, you can stay in cave hostels for around $15 a night, but if you’re looking to splash out on a once in a lifetime experience, there are great hotels that may come with a higher price tag, but will provide luxury cave rooms with amenities like jacuzzi tubs, meals and incredible views. If all of your hiking, horseback riding, and general explorations have worn you out, there’s a little spa on the edge of Ortahisar that you wouldn’t recognize from the side of the road. Or the parking lot. I actually thought I was in the wrong place until the door opened and Katpatuka Camur appeared. The whole building is beautifully carved from stone, in keeping with the regional theme, and incredibly low lit. Your spa trip includes a fish pedicure, a mineral water bath, and a massive mud pool you can play in to your heart’s content. Colorful hot air balloons before launch in Göreme National Park, Cappadocia, Turkey. 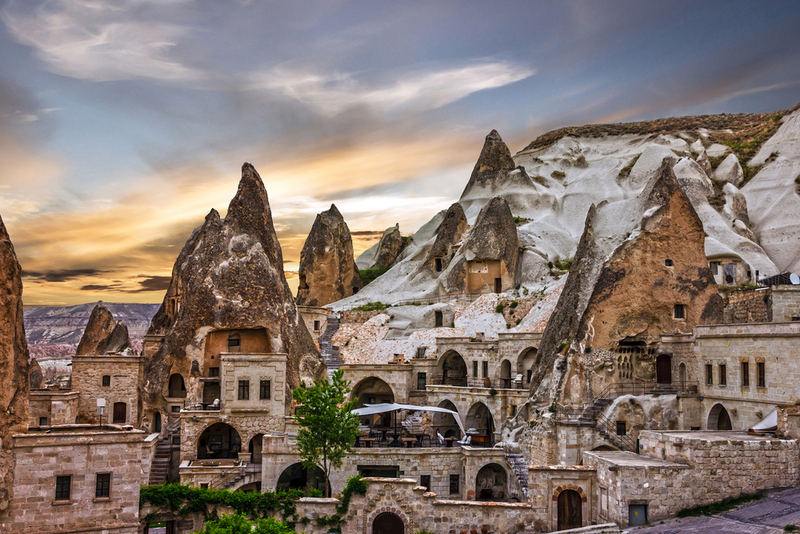 Every morning at sunrise, Göreme transforms into a magical village right out of a fairytale. 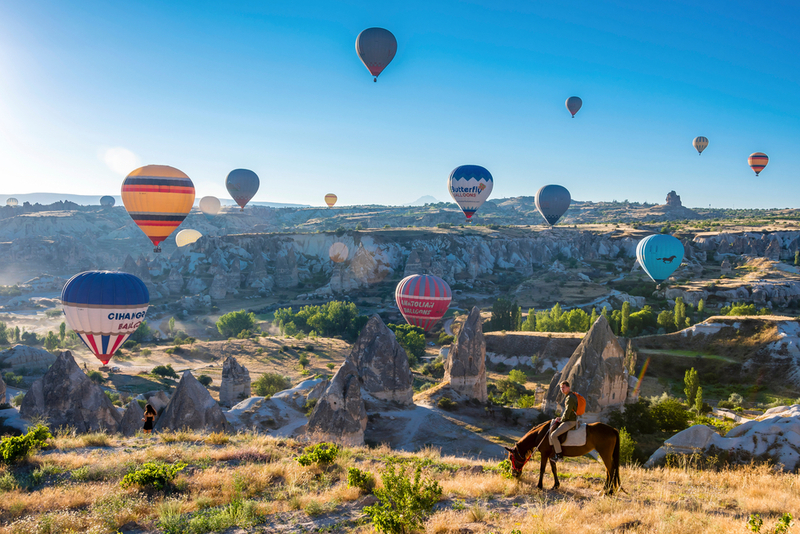 Over the fairy chimneys and canyon edges, more than a hundred hot air balloons take to the Cappadocia sky. As the first light starts to filter into the sky, you can already hear the low roar of balloons filling up in the distance. Sunset Point, also known as Lover’s Hill, is the best place to get phenomenal (and very photogenic) views of the sunrise, and it often fills up with tourists who are almost as fun to watch as the sky itself. And okay, if you’re dying to hop in a balloon and take it all in from a bird’s eye view, there will be plenty of opportunities. Your hotel should be able to hook you up with a tour company (most companies will even throw in a bottle of champagne so you can sip some bubbly from the comfort of your balloon basket), but I recommend using caution and doing your research to find a company that is reputable, safe, and exercises extreme caution in high winds.